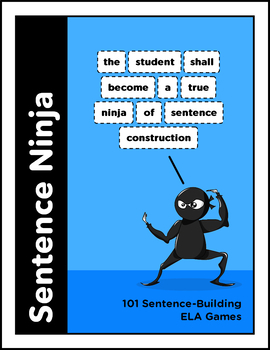 Sentence Ninja is the super fun language-building game in which students are challenged to use given word tiles to create the lengthiest, most meaningful sentence possible--scoring points depending on which letters in the set are used. Not only that, but the word set for each Sentence Ninja game can be used to make a full sentence. Your students will have a blast as they attempt to use all the words in just one sentence, to score the most points possible! 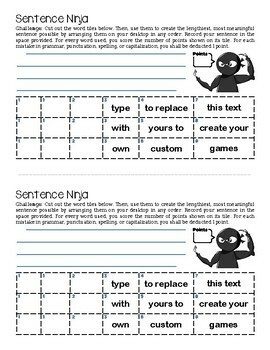 Included is a customizable template for creating Sentence Ninja games with words you choose! Yay! 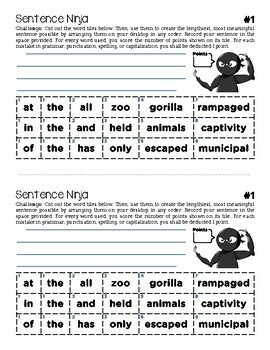 This digital download contains 101 original Sentence Ninja games, each with a different set of words, plus a full answer key for each game. Sentence Ninja is ideal for grades 3 to 8.